The University of Texas at Dallas campus. 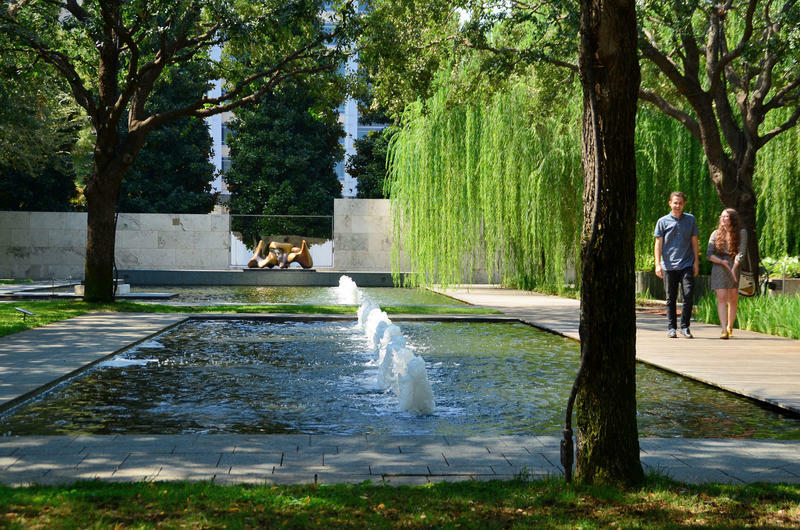 The Nasher Sculpture Garden in the Dallas Arts District. The National 9/11 Memorial in New York City. Landscape architect Peter Walker is the inaugural winner of the University of Texas at Dallas’ Richard Brettell Award in the Arts. The $150,000 prize – the richest arts prize in Texas – was established by arts patron Margaret McDermott to honor Bretell, a distinguished arts professor at the university. 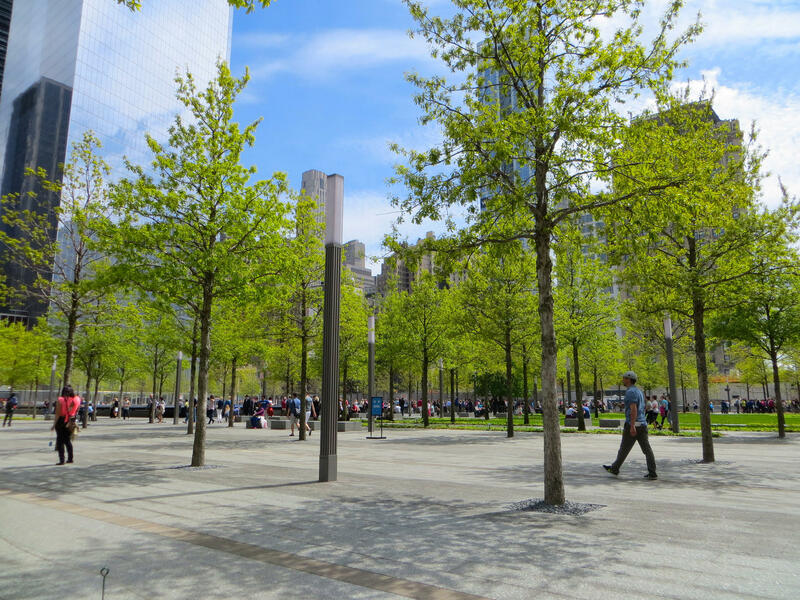 Walker, one of the world’s leading landscape architects, is the designer behind the Nasher Sculpture Garden, the National 9/11 Memorial in New York and dozens of public parks, plazas, gardens, corporate headquarters and museums around the world. He also designed UT-Dallas’ campus. Walker joined host Krys Boyd on Think this week to discuss his life and work. Listen to highlights from the Think interview with Peter Walker. “Well, let’s talk about Nasher. It’s a perfect case and point. Nasher daughters were very concerned that there were all these high-rise buildings around, and that you would not have a peaceful setting for the sculpture. But I pointed out that Central Park has towers all around it. And that sort of competition between the romantic aspect of the gardens at Central Park and this urban setting is one of the great contrasts — one that makes it really beautiful. 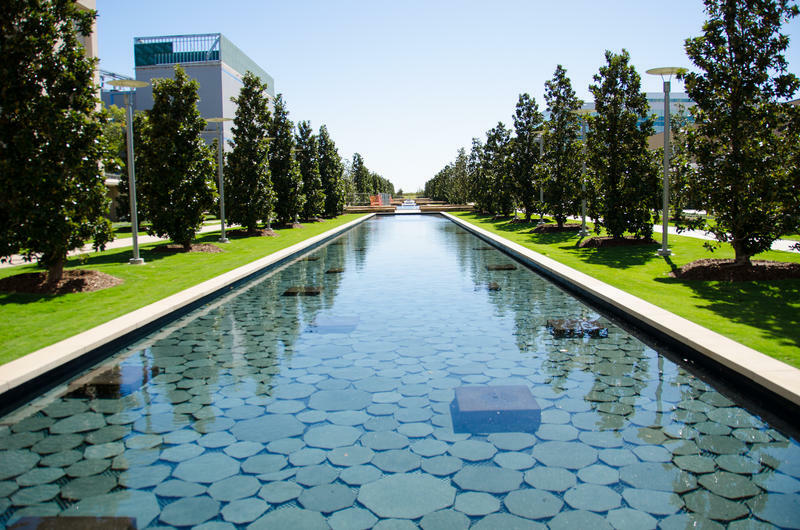 “[Margaret McDermott] was looking for a landscape architect that could do a project out there that could spiff it up, make it look more like a campus — because it did look a little like an industrial park. It had very little character. Buildings were not particularly good, except for the library. And she had a dream about this thing, and her solution to that was to do a single project. “We got a contract to do a master plan, to show where this thing was going, and we discovered a number of things like: They didn’t really have enough land; they should be conserving land immediately. There were these creeks that were in the old cotton fields and part of them had been put underground, part of them had been lost, part of them had been civil engineered away. And those were the last remnants of the natural landscape that was there. "So we took that scale of thinking and then tried to make the first part something distinct enough so you would remember it. And the whole idea was to have something that didn't look like any other school."